It was when the owner of the building that once hosted Vail Holt funeral home in Historic Madison Indiana was repairing a damaged wall in the staircase area for the third time that he realized something had to be done. Persistent leaks in the box gutters were causing extensive damage not only to the interior side of the wall but the moisture was also beginning to cause the exterior paint to peel and mortar between the old bricks deteriorate. 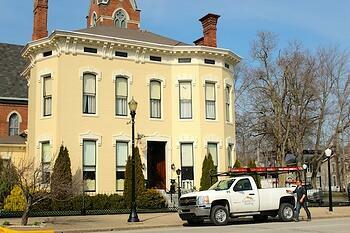 The building owner reached out to Exterior Pro Roofing for help finding a feasible solution. The sheet metal box gutters had started out leak free and had directed rain and melting snow to a downspout successful for many years. But over time the soldered joints had cracked and even rust hole were beginning to appear in areas that held water. Roof coating had been used but the leaks always came back and each time a little worse than the last. The owner was looking for a better way and a long term box gutter repair option. Exterior Pro Proposed to line the box gutters with a PVC membrane and add metal edge trims so that the new liner could be taken over the edge of the box gutter but the job wouldn't be easy. The building is tall and difficult to access, there had to be a balance of keeping workers safe while also getting work done. It took 4 skilled roofers just over four days to line the box gutters and set new trims. The liner had to be installed underneath the existing shingles and new drain flashing also had to be installed so that water would enter in the downspout without leaking through box gutter. The 4 large chimneys also had to be flashed on the front side facing box gutter but the roof shingle flashing around the sides and back had to remain intact and water tight. The building owner no longer worries each time it rains and the interior wall can be repaired for the last time. 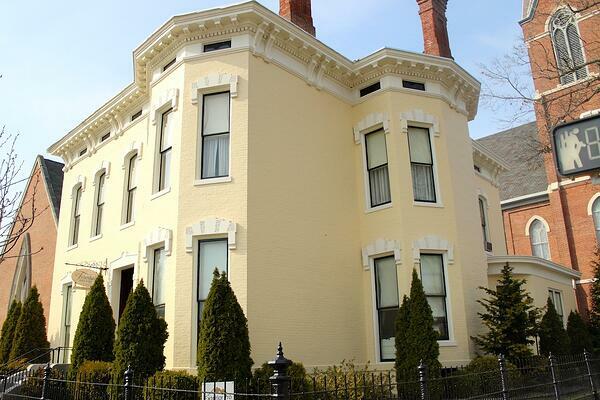 The buildings appearance was enhanced with new metal trims all while maintaining historic value and the new box gutter liners will protect the building for the next 20 years. 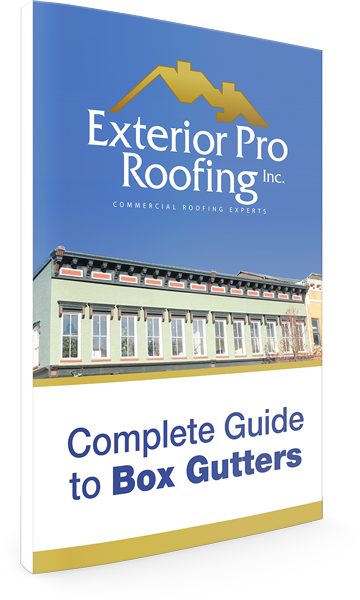 Learn the common reasons that box gutters leak and the repair options to stop those persisten box gutter leaks.